This functionality does not work yet. Don’t bother trying to use it. 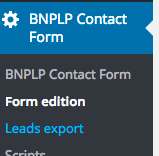 Fields of a form can be added from the “Form fields” tab. There are two level of export: domain export and general admin export. A domain export allows to export leads of the current domain (i.e. export leads of reim.realestate.bnpparibas). A general export allows to export all leads of a given domain or all leads of all domains.